Bore mm / Thickness (in. ): 2.3L - 94mm / 0.030" 2.3L - 94mm / 0.040" 2.3L - 94mm / 0.050" 2.3L - 94mm / 0.060" 2.3L - 94mm / 0.070" 2.3L - 94mm / 0.080" 2.3L - 94mm / 0.092" 2.3L - 94mm / 0.098" 2.3L - 94mm / 0.120" 2.3L - 94mm / 0.140" 2.5L - 95mm / 0.040" 2.5L - 95mm / 0.050" 2.5L - 95mm / 0.060" 2.5L - 95mm / 0.070" 2.5L - 95mm / 0.080" 2.5L - 95mm / 0.092" 2.5L - 95mm / 0.098" 2.5L - 95mm / 0.120" 2.5L - 95mm / 0.140" 2.5L - 95.5mm / 0.060" 2.5L - 95.5mm / 0.070"
Multi-Layered Steel Head Gaskets are designed to withstand much higher combustion pressures than the factory head gasket and other conventional or modified head gaskets. Made to the finest specifications and run all around the world on the street and in various forms of motorsports; they are made from a minimum of 5 layers of which the outer layers are a patented type of material to ensure proper sealing of fluids. This design ensures a complete combustion chamber seal and elimination of failure due to weak factory gaskets blowing out under boost or high performance use. These gaskets are available on a variety of thickness', from as thin as .027" up to .140". We use these on every performance engine we build. 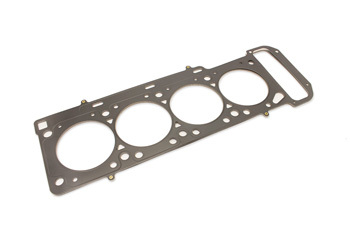 This gasket is a great way to change compression slightly up or down without having to buy new pistons. From simon latimer of altona, Victoria, Australia on 4/21/2013 .